Ethical leadership is understanding your core values, and possessing the courage to act on them in every aspect of life—rather at home, at work, at school, etc. Ethical leaders are capable of withstanding social pressures that ask them to conform, or sway away from their ethical standards. An ethical leader takes the values she has learned to respect over the course of a life time, and implements them into her business and professional life. 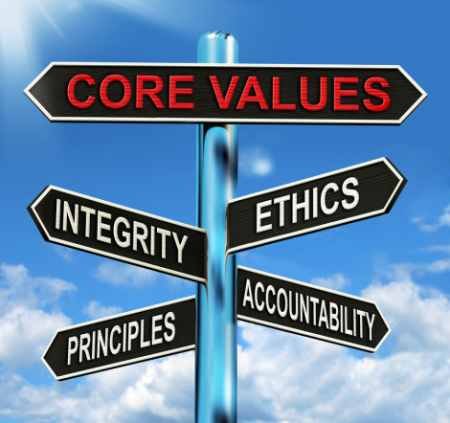 We have put together a few tips on how to fully understand, embrace, and show your core values. Don’t shy away from analyzing the gray areas, and the difficulties in implementing your ethics into the workplace. Get others involved in the discussion, and hear their opinions with open ears. A great leader isn’t afraid to talk about hard ethical decisions, and will help others act more responsibly by offering a great example to follow. Strong leaders must make it clear that ethical behavior in the workplace is not an idealized dream. It is a part of every action people take in and out of the work environment. It is not just something written in a manual; it is a way of life. Every aspect of company life should involve discussion on ethics – board meetings, management meetings, training programs, etc. Respect for those around you must take precedence. You need to show this by your words and actions. Create a workplace environment that cultivates respect among peers. People should feel comfortable talking about ethics and sharing in the practice of it. Doing this will build trust, open communication, and a feeling of shared responsibility for living out the organization’s ethical standards. As a great leader you need to show those under your leadership that actively engaging in ethical issues is important to the success of the organization. Discuss how ethical behavior affects client activity, and illustrate why ethics is more than just complying with regulations and laws. By leading by example, you will demand that your workers commit themselves to strong ethical standards related to social justice, long-term sustainability and human rights. Don’t listen to excuses. Allowing even one employee an ethical pass will undermine the entire organization. Make sure everyone understands, by your leading example, that the ethical standards laid out are totally absolute, and non-negotiable. This applies to top-tier managers and other high level officials as well. Trust in ethical leadership always starts from the top! A pat on the back can go a long way. By rewarding strong ethics, you will instill an overall sense of pride within the company, and an eagerness to act responsibly. Always take time to point out examples of ethical behavior, so employees will know what to do, and what not to do. Treat ethical behavior like an ever evolving journey. You can always improve, and should encourage others to always challenge themselves to behave as ethically as possible. Organize different ethics training on a regular basis. Ensure everyone knows what the right thing to do is in your organization. Remind everyone that ethical decision making is part of everything they do, and influence. The world around us can change, so it’s important to instill a need to always stay vigilant in regards to ethical actions. I am sure there are more ways to implement ethics into our daily tasks. Let me know, in the comments below, what else would you add to the list.